Developed by two financial planning experts who also have family members with special needs, this one-of-a-kind book is an absolute must-have as parents and other caregivers plan for the lasting financial security of their families. Included are all the tools families need to create an effective action plan for their finances: planning checklists and forms, a helpful glossary of financial terms, planning pointers that help readers remember key points, and extended case studies dramatizing other families evolving challenges and solutions. Plus, the CD-ROM in the back of the book contains a helpful Financial Planning Timeline and a printable Letter of Intent that lets parents communicate key information, concerns, and desires to future caretakers. A book parents will use for the rest of their lives, this guide is also a necessary addition to the reference library of every service provider. 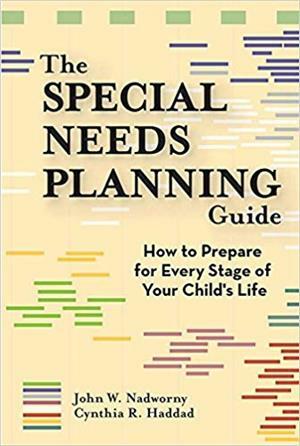 "The first of its kindProvides a clear roadmap and set of guidelines to demystify the challenges of planning for individuals with disabilities, and their families." Full textThe authors, both active in national parent and advocacy gorups, present financial planning information in chronological format. Besides financial support, the book looks into the emotional, family, legal and health aspects of planning, and incorporates valuable resources and practical solutions. "This is the definitive guide to special needs planning, written by two authors whose personal experience, depth of professional knowledge and financial expertise qualifies them perfectly. It is a super book in every respect, and will become indispensable to all parents who use it." "Planning for the legal and financial needs of even a 'normal' family can be overwhelming, but add a child with special needs to the equation and the degree of difficulty soars. Authors Nadworny and Haddad have family members with disabilities, so they know the problems firsthand -- and try to guide you gently away from them in a calm, compassionate, and only mildly panic-inducing guide." "An extremely valuable resource for both families and professionals who seek to provide for the current and future care and quality of life of an individual with special needs." "A must-have reference. . . will serve as a great tool to help families navigate through the many challenges, while giving them thoughtful and practical solutions." "A treasure chest of information . . . held together with family values that close gaps and lead to goals." "Excellent...simply written and understandable, yet concise enough to serve as a road map that will assist families of persons with special needs to navigate the highway of life from childhood to adullthood." "Will become a classic for families who have special needs children...There is no other resource book like it for parents."